Looking for something to give or request as a holiday gift? Love to cook but feeling stale in the kitchen? Want to spice up your culinary repertoire? Here's the thing for you. 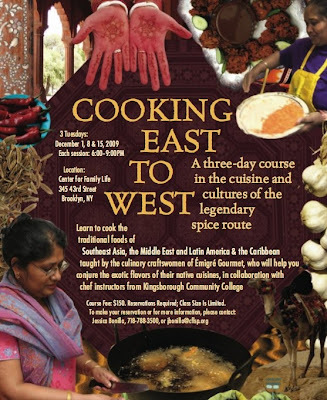 The Center for Family Life is hosting a cooking class called Cooking East to West - A three day course in the cuisine and cultures of the legendary spice route. Instruction will be by members of Emigre Gourmet, a group of Sunset Park women who are launching a cooperative catering business, together with chef instructors from Kingsborough Community College (which has an amazing beach in the summer available to all registered students, even those registered for just one class). It's a three-session course with food from Southeast Asia, the Middle East, Latin America & the Caribbean. Mmmmmm. The three December classes (three hours each) cost $150, no small fee, but I'm sure a fantastic dinner is included. Like I said, it's a good opportunity to give or receive a gift - or to treat yourself. They all take place at the 345 43rd Street CFL location. Call 718-788-3500 for more information or to make reservations.